Can any joke be bigger than this? Arrogant Aussies trying to preach morality and behavioral lessons to the world. Border, Ponting, Lehman, Hodge all can go to Hell. Hey guys! How’s the taste of your own medicine. Remember this is what it tastes for the guys at the receiving end. Knowing your ancestry and lineage you guys had it coming! You stretched the patience of the world a bit too far and got away so far. Not anymore! The facts were there for all to see. Suddenly, they became aware of the decent behavior respect for the dead – heights of hypocrisy. If they can get so nasty with a guy in front of them, imagine their misplaced respect for the dead, which they are trying to bring up. Ponting’s behavior was befitting a paragon of virtue, wasn’t it? when he asked an Union Minister off the stage. Hey! compared to Aussies incestuous behavior almost all the time, Gavaskar‘s statements are angelic. I am surprised that no one is publicly standing up to it with Gavaskar. And yes! what was wrong, he stated facts as it were. 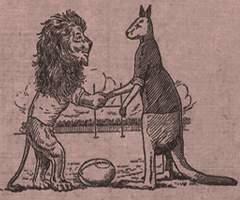 A bar room brawl pales before the arrogance and sledging that these kangaroos are famous for (sorry, kangaroo for the insult).